Members monitor parish-wide athletic activities and gym usage, ensuring that all coaching and outfitting needs are met. The committee also sponsors fund-raisers throughout the year. 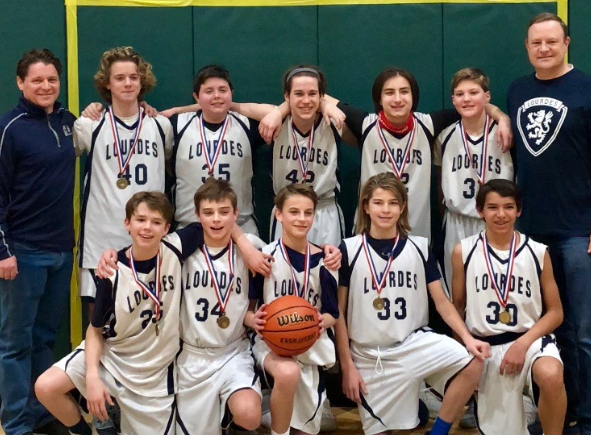 The Athletic Association of Our Lady of Lourdes was created in order that the youth of our parish may be given the best opportunity for well organized, programmed, equipped and supervised athletics and recreation. Officers, committee heads, coaches and managers should see through the uniform to the soul of the child, realizing that such a program is ultimately for the purpose of training the character of youth and helping them to grow in union with Christ. Through this program, youth learn respect for authority, team play, and fairness in play, so as to carry these with them into later life. To promote athletic activities in our parish. To provide leadership for athletic activities in our parish. To provide opportunity for teams or individuals to participate in athletic competition. To provide and maintain uniforms and equipment for all athletic activities by this association. To govern the use of athletic facilities and equipment. To decide on the eligibility of players according to the rules and regulations as set forth in the constitution of the association. To provide necessary finances to conduct this athletic program properly. To enforce rules and proper conduct of all participants in all athletic activities and in the facilities where they take place. To insure all participants playing time in all games. To develop each participant to his/her fullest potential. ​The Athletic Association is an organization that promotes sports throughout the grade school and high school levels. We sponsor several events through the year as well as seven major sports. The sports are soccer, volleyball, basketball, baseball/softball, golf, chess and track. All are welcome to join our organization. Meetings are held on the third Tuesday of the month at 7:30 p.m. Look at the school calendar for specific dates. In order to make all activities run properly, we need the support of our parents. They can volunteer as coach, assistant coach or business manager. Also, all parents must sign up for a class activity on book day. Kindergarten through second grade will work the Fish Fry in March. Third through fifth grade will sign up for the Back to School Barbecue and the Beer and Grill booth at the Carnival will be staffed by sixth through eighth grade parents. If you would like to schedule the gym for practices, etc., please contact Julie King at Julie.king@ucitylourdes.org. Requests must be made within 24 hours of your desired time slot. Click the gym schedule below to view the calendar.